In content marketing, painting the right picture with words – simplicity as in a garden of roses – yields better results. Complex, technical pieces don’t have to be monotonous. You want your audience to relate to your writing, right? Simplicity is important if you want to reach financial decision-makers not just geeks — especially in small to medium enterprises. More on that later. If you want a rosy response from blogging technical topics — simplify your content — to make it more popular. Take your readers for a walk in your garden of ideas. Studies have shown the average time readers spend on a Web site in the U.S. is about three minutes. You can increase the average time-spent-reading by users by making your blog easy to read while decreasing your page download time. Whether it’s a fast-food customer or Web-site user, Americans want convenience. Your headlines should quickly pique the interests of visitors. Readers love how-to checklists with either bullet points or numbers. So use a format that allows readers to quickly scan your topic to see if they want to invest time in digesting your content. Less is more, so use white space to avoid the appearance of clutter. Take your readers for a walk in your garden of ideas. Readers are often intrigued if they see photos of people. But graphs and charts to illustrate points are appealing, too. Another technique to consider is the use of images as metaphors. Metaphors will make your topic memorable. It’s too easy to fall into the trap of using mundane, or boring, language. Look for ways to brighten your copy to appeal to the readers’ senses. If you want readers to buy your ideas, remember all buying decisions are based on emotion. Avoid adverbs and use action words that evoke emotion. An IT geek often has to get permission to spend money. If you want a tech person to feel comfortable in submitting your ideas to the boss, your points must be easy-to-understand. Hence, the need for simplicity. So make your ideas universally attractive. 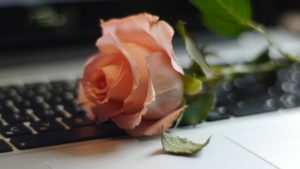 Like the image of roses, as a metaphor in this post, your copy will be more successful if it’s something with which most businesspeople relate. Write with colorful examples. Use case studies – readers love succinct authoritative data and to read why other people are successful. If you do it right, readers will want more information. You can provide it by linking to your other articles. The search-engine crawlers will be impressed with your blog, which will improve your site’s ranking. Factors include the using the right keywords for searchers, the time-spent-reading and the number of pages per visitor, as well as the volume of hits and use of bandwidth. SEO and Other Strategic Tips for a No.1 Rated Blog — To own your blogging niche, you must understand the evolving process — important basics in search engine optimization and other strategies. If you’ve been blogging for awhile, you know success doesn’t keep come automatically. Blogging is arduous work. You must have a strategic blogging goal. Make Your Blogging, Social Media and PR Work to Attract Fans –Businesspeople have discovered social media is a work in progress. It takes huge amounts of time, not only to implement innovations, but to succeed.